SRT type replaced by RT. 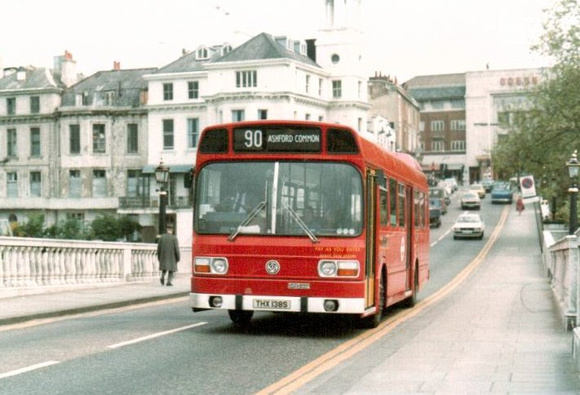 Sunday Route withdrawn in favour of new route 90C. Twickenham garage closed - allocation transferred to FW. Re-routed at Twickenham via Hampton Road and Sixth Cross Road to facilitate easier crew changes for Fulwell Garage. Sunday withdrawn between Richmond and Kew. Sat and Sun converted from RT to RM. Saturday allocation reverted to RT type. Converted to One Man Operation and withdrawn between Richmond and Kew Mon-Fri evenings and Saturdays outside shopping hours. Withdrawn between Twickenham and Richmond Mon-Fri evenings and Saturdays outside shopping hours and further withdrawn between Richmond and Kew at all times. Monday-Saturday extended from Staines to Egham Station replacing withdrawn section of Route 117. SM type converted to SMD. Withdrawn between Staines and Egham. Sat and Sun converted to double deck Metrobus. Monday-Friday converted to double deck M type. Route withdrawn - replaced by Revised Route 290. Crew Changeover point at ? ?